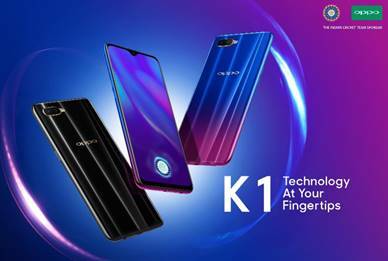 The OPPO K1 is a competitively priced smartphone, which comes with an in-display fingerprint scanner and 6.41- inch screen with AMOLED display, ensuring the consumers enjoy their favourite shows/movies in higher definition. The new device features a 25 MP front-facing camera and is powered byQualcomm® Snapdragon™ 660 Mobile Platform, making it ideal to support heavy applications. The OPPO K1 uses Corning® Gorilla® Glass 5 and comes with a 4GB RAM + 64GB ROM memory, improving the speed and performance.